The Cherry Hill Master Plan update envisions integrating multimodal transportation with the township's highway-centric development. How will South Jersey’s most significant economic hub reinvent itself for the next decade? A master plan update envisions reinvigorated neighborhood character, more transit options, and smaller households. 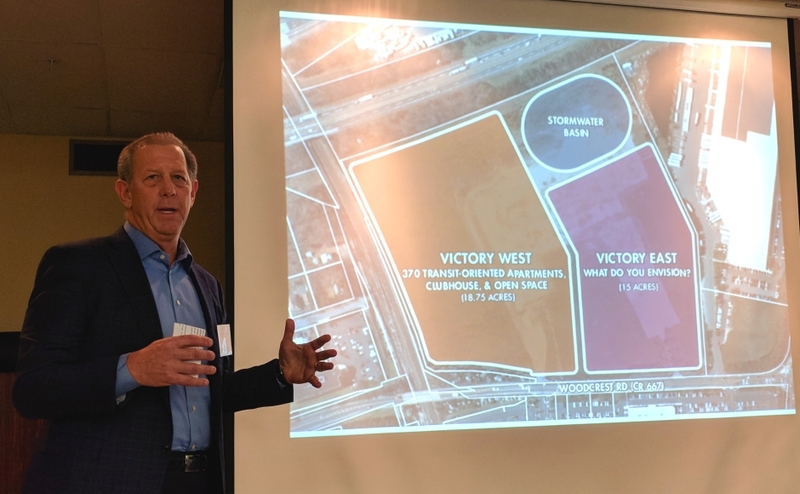 Cherry Hill Mayor Chuck Cahn talks about the Victory Refrigeration Redevelopment Plan at an April 2018 visioning meeting. Credit: Matt Skoufalos. 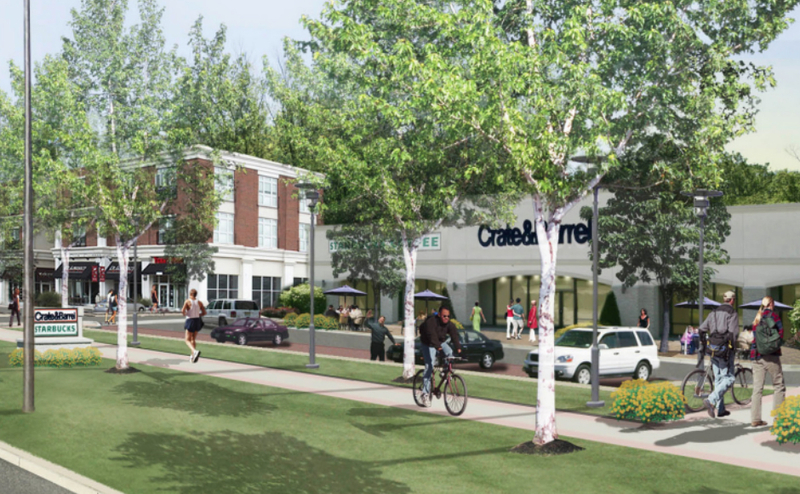 Founded as an assemblage of farmland straddling highways, Cherry Hill has boomed into a community of more than 70,000 as “the epitome of the American Post-War suburb,” according to the authors of its Master Plan update. That document, which outlines a decade-long vision for the township and its immediate future, will be presented to the township planning board Monday night for its review. 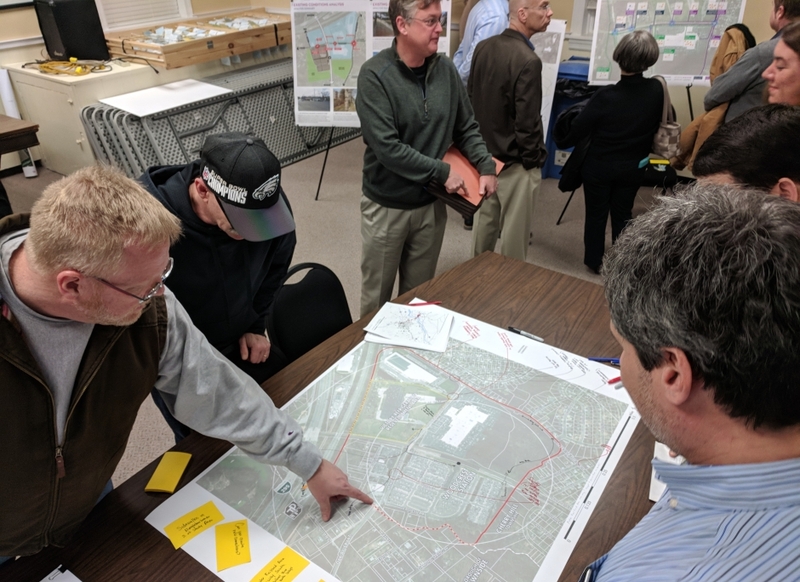 Written over the course of two years by Group Melvin Design, and with input from township residents and officials, the 2018 Cherry Hill Master Plan considers what it would take to standardize the look and feel of a community that is showing some signs of wear at the edges. Population growth in the 70,000-resident township has likely peaked, and may plateau over the next quarter-century. But from Philadelphia to Wilmington, Cherry Hill is still the number-three jobs market behind only the City of Brotherly Love and King of Prussia; it’s home to twice as many jobs as the next-largest community, Camden City. Still, fewer than 5,000 of the 53,725 people who work in Cherry Hill are township residents, and that’s not the only way in which its demographics are changing. 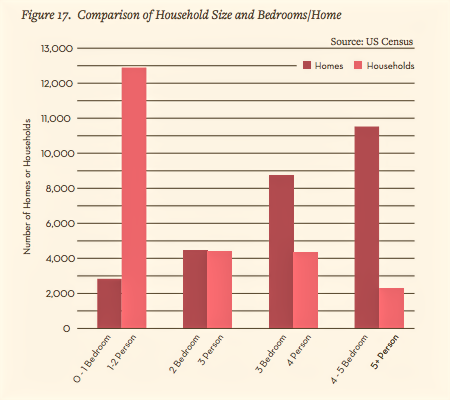 Cherry Hill household size and housing inventory, as presented in the 2018 master plan update. Credit: Cherry Hill Master Plan Update. More than 70 percent of Cherry Hill’s housing stock was built between 1940 and 1980; only 5 percent more was built in the last 20 years, and the bulk of those are three- and four-bedroom, single-family homes. Since the time when the vast majority of those homes were built, the median age of the community has increased from 29 to 42 years, with 25 percent of residents having occupied the same home for a quarter-century. “Residents are aware that many of the young families that moved to the township 20 to 30 years ago are now empty-nesters who want to remain in the township,” the study notes. Cherry Hill has also seen single-person households up 36 percent between 1990 and 2014, with three-plus-member households on the decline. That means “Cherry Hill has substantially more three- and four-bedroom homes than it has three- and four-person households to fill them,” the report notes. West-side neighborhoods like Kingston and Erlton are “really working well” for families seeking low-cost starter homes or rental units, Cahn said. Larger, single-family homes on the east side of Cherry Hill, however, aren’t suited to the kinds of buyers the township will have in the next decade-plus. Accessory dwelling units like these could be considered in the future in Cherry Hill as seniors look to age in place. Credit: Cherry Hill Master Plan Update. “The future of those homes is at risk,” the mayor said. How to manage that transition is a question not entirely taken up by the document, which points out a variety of strategies employed in north Jersey communities like Morristown to deal with the issue. These include plans for rezoning bigger properties for multifamily purposes, or adding in-law suites and semi-attached units—all of which could help a township like Cherry Hill straddle the needs of both millennials and seniors looking for affordable places to live. “It’s an interesting question, and one that we were not willing to tackle in this master plan,” the mayor said. “To start allowing those [housing types] without a variance and not rezoning is a much heavier lift. “We don’t have the answers to these neighborhoods that have these large homes,” Cahn said. “What we see now is a lot of sales; we see a lot of residential growth for people moving in. 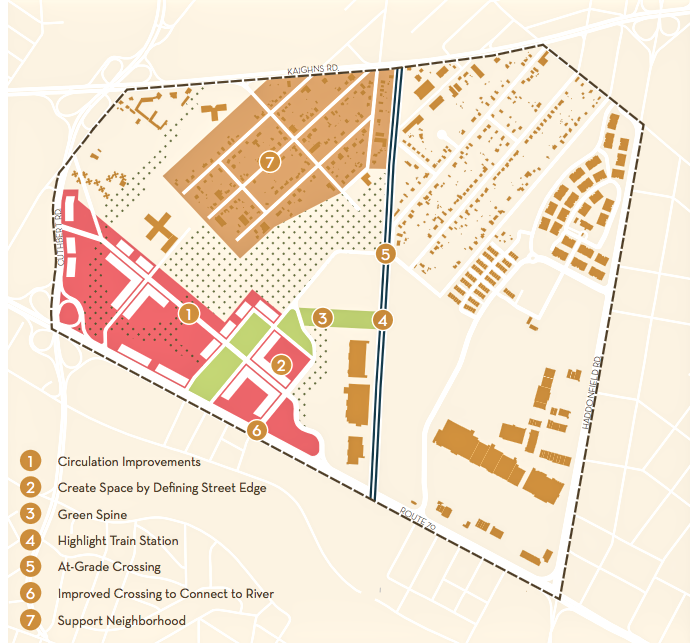 Envisioned improvements to the Golden Triangle area of Cherry Hill. Credit: Cherry Hill Master Plan Update. In the meantime, Cahn said the township will rely on its multifamily housing redevelopments, including parcels at Hampton Road, Park Boulevard, and Brace Road, all of which were connected with the settlement that preserved Woodcrest Country Club as open space. There could be additional opportunities for similar development closer to transit hubs at Woodcrest Station and the NJ Transit rail line on Route 70, as well as closer to the Cherry Hill Mall. 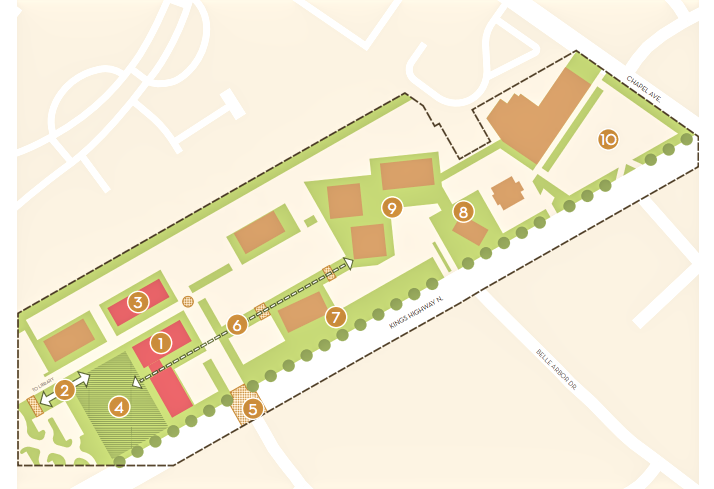 Cahn foresees the mall area as potentially progressing along a downtown-centric model that has been employed at King of Prussia, possibly transforming Church Road into a main street throughway, with plazas, parks, and multi-use paths connecting the mall and its surroundings. “It’s an older mall that goes back from the 60s; it’s not really pedestrian-friendly,” the mayor said. “It needs to be thought about as to what could exist there. Those office towers might not exist in the future. Similarly, the master plan identifies the Batesville neighborhood, which extends from the western edge of Haddonfield down Brace, Kresson, and Haddonfield-Berlin Roads, as an area to be studied for future redevelopment and definition. 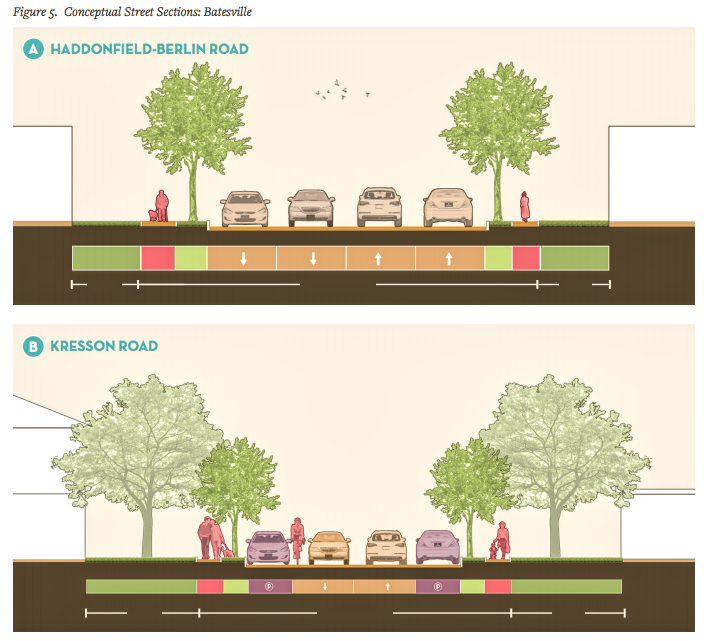 Possible changes to the streetscapes in the Batesville neighborhood. Credit: Cherry Hill Master Plan Update. The master plan calls for any new development to touch on Batesville “as an important historic asset” with connections to the Underground Railroad. The master plan also foresees significant redevelopment of the Golden Triangle neighborhood as a mixed-use development built around Cooper River Park and “upgraded train service” to Philadelphia via the NJ Transit station on Route 70. Like the Woodcrest PATCO Station, which is already the subject of redevelopment efforts, those neighborhoods have been close-but-not-enough to the transit-oriented vision intended at their outset. The plan considers the transformation of the Cherry Hill Library-adjacent Kings Highway Office park as a potential future site of a new township municipal building. Without significant demand for the suburban office towers there, the central location of the site could offer a more easily accessible government campus and related amenities. Potential vision for a future, centrally located municipal complex in Cherry Hill. Credit: Cherry Hill Master Plan Update. Relocating there could also allow the current facilities on Mercer Street to be transformed into recreational space more in keeping with the surrounding context, Cahn said. “In the future, the town will need to look for a better space,” he said. “It’s not a definite; we’re not zoning anything, but the current town hall is dated. The master plan also explores returning the Erlton section of Cherry Hill to a more downtown, neighborhood feel in keeping with its historic context. It envisions a consistently designed main-street corridor, with better access to shopping and dining by adding municipal parking off Route 70, pedestrian improvements, landscaping, and traffic-calming measures. There’s also guidance for rezoning the Springdale Industrial Park to cover the more inclusive business uses that have cropped up there. From the launch of the Garden State Discovery Museum, the park has grown to incorporate more experiential retail and entertainment attractions, including axe-throwing, escape-room, and commercial brewing operations. More flexible uses would encourage the creative approaches to the space that are finding their way there organically, Cahn said. “It can be pedestrian-friendly; it’s kind of self-contained,” he said. “It’s got some internal roads. We call out for flex spaces that can be almost anything—sports spaces; for artists, incubator-type spaces. “Because it’s industrial zoned, and the people who do want to go in there end up getting variances, we may expand or redefine what an industrial zone is,” the mayor said. 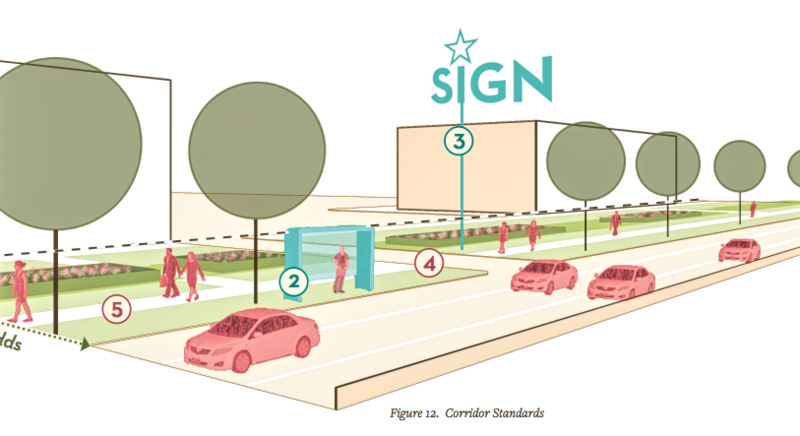 Standardization of its commercial corridors could help Cherry Hill highways combat placelessness. Credit: Cherry Hill Master Plan Update. The master plan updates also consider significant changes to the highway corridors that divide and define Cherry Hill, calling for realignment of the businesses along them to combat the “placelessness” that long stretches of road can engender. 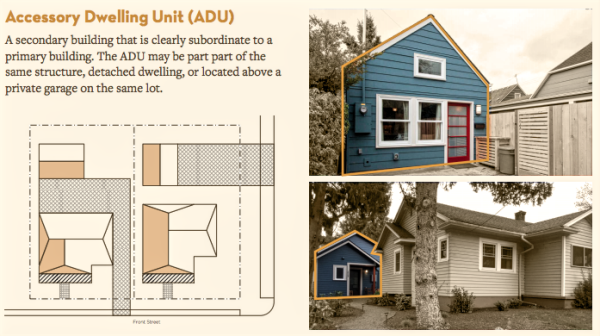 Their “inconsistent ‘front yard’” looks, variable building forms and setbacks, disconnected signage and sidewalks, and overall “disjointed conditions make the corridors difficult to understand, and feel cluttered and sometimes unwelcoming to users,” the report notes. “The corridors of the township have a sense of placelessness and lack of an identity,” it reads. “They are overwhelmingly composed of concrete, and are visually unattractive, with limited consistency along edges. They are not seen as pedestrian- or bike-friendly, and their designs encourage vehicles to speed, making them dangerous to cross. They also contribute to poor microclimate; they are hot and loud, and the air quality is poor. The plan suggests transforming these spaces through public art and a “pattern book” that would help evoke the mid-century placemaking aesthetic of the township’s historic neighborhoods and bygone roadside attractions. “Everything from murals and sculptures to creative sign packages and distinctive building decorations” could help accelerate this transformation, the plan notes. 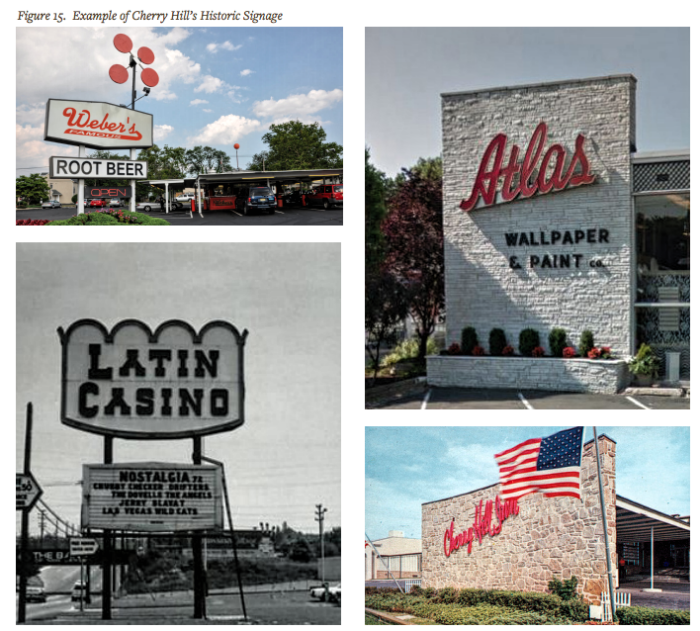 Celebrating some of the historic, mid-century signage of Cherry Hill could help the township redevelop its highways. Credit: Cherry Hill Master Plan Update. These changes could also reflect resident opinions “that national chains are replacing the mom-and-pop shops that Cherry Hill was once famous for,” the study shows. “Residents felt that small businesses in the township needed greater community support, and events such as street fairs should be encouraged so that mom-and-pop shops have more opportunities to interface with the public,” it reads. Cherry Hill resident opinions on transportation access. Credit: Cherry Hill Master Plan Update. “Many residents recalled that the township, in past decades, was home to a larger amount of locally owned businesses, but these businesses seemed to be pushed out by higher rents demanded by property owners looking to attract national chain retailers. Cahn believes the township still has significant viability as a regional retail hub, in which demand still exists for larger-scale commercial developments. Neighbors pore over plans for the Victory Refrigeration redevelopment at Woodcrest. Credit: Matt Skoufalos. The mayor said that future development in the township should be kept to corridors along its major highways to avoid pushing traffic into residential neighborhoods. But with more solutions for rapid transit, bike use, and walkability, he hopes the future look of the township will be more inclusive of a variety of modes of access. “Most master plans are very zoning-oriented; this is a lot of interesting perspectives on a vision, goals, a sense of place, a lot of demographics,” Cahn said.